Explore Sikkim and discover Sikkim, Darjeeling and Kalimpong, is provides excellent tours experience in Sikkim, Dajeeling and kalimpong. Sikkim's near about 200 monasteries or Gompas belonging to the Nyingma and Kagyu order have not only been influencing the cultural heritage and lifestyle of the people, but also demonstrates the ancient rituals in practice. Devoted Lamas robed in red, chant ancient mantras to the rhythm of drums and trumpets while soft lights flicker from decorative lamps placed before statues of the great Guru Padmasambhava. Feel the peace and quiet of being one with nature and close to the almighty as sacred words mingle with the whirring prayer wheels. The Gompas are adorned with life-like frescoes of hoary Buddhist legends, rare silk and brocade Thangkas. Also preserved here, are ancient Tibetan manuscripts, exquisitely carved wood work and icons of silver and gold. Meeting and assistance on arrival and transfer to Darjeeling. Overnight at the hotel in Darjeeling. Day 02 :DarjeelingFull day sightseeing of Darjeeling. It includes: Early morning sunrise view from Tiger Hill. The view from this point is unforgettable, for colours changing from grey to pink and to luminous gold. Mt. Everest (8,848m), the world’s highest peak is visible from Tiger Hill but being 170 km away does not stand out as strikingly as the nearer Kanchenjunga. After breakfast, visit Himalayan Mountaineering Institute, the house of Late Tenzing Norgay, the sherpa who first climbed Mt. Everest with Edmund Hillary in 1953. Then visit Natural History Museum, Lloyd Botanical Garden established in 1878 and the Zoo, specializing in high altitude species. Afternoon visit to Tibetan Refugee Self Help Centre which produces and sells a wide range of Tibetan artifacts and curios. Here you can see Tibetan craftsman making traditional items like carpets, woolen boots, wood carvings and leather boots. The centre was established in 1954 to rehabilitate those refugees who had fled Tibet with Dalai Lama in the wake of the Chinese invasion. Overnight at the hotel in Darjeeling. After breakfast drive to Gangtok. Afternoon free for shopping and leisure. Overnight at the hotel in Gangtok. Day 04 : Gangtok Full day sightseeing including visit to ; Enchey Monastery; it is a beautiful monastery, in an equally beautiful setting, approached along an avenue of hundreds of multi-coloured prayer flags. Government Institute of Cottage Industries; here you can watch young students being taught the traditional art of thangkha paintings along with weaving, wood carving and carpet making. Also visit the Institute of Tibetology, housed in a beautiful building, built in traditional Tibetan style, with mural decorated columns and a wonderful smell of beeswax polish from the creaky wooden floor. Then drive through picturesque, terraced rice fields to the headquarter of Dharma Chakra Centres (Rumtek Monastery), the present seat of His Holiness, the Gyalwa Karmapa, head of the Kagyupa sect. Said to be the replica of the monastery at Tsurphu, Tibet with its traditional architecture, exquisite paintings, intricate wood work, housing treasures of manuscripts and icons. Rumtek is a splendid example of Tibetan monastic art. Overnight at the hotel in Gangtok. Morning drive to Kalimpong. Afternoon visit to Tharpa Choling Monastery, belonging to the Gelugpa sect of Dalai Lama. 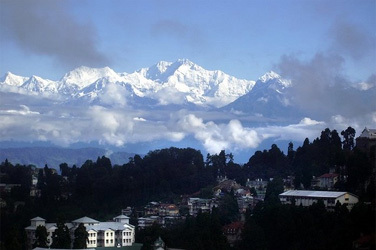 Then drive to Deolo Hill, the highest point in Kalimpong at 5,500 ft, which offers good view of the surrounding region. It also has two water reservoirs, the source of Kalimpong drinking water. Then visit Zong-Dog Palri Fo-brang Monastery followed by visit to Gauripur House, the favorite retreat of Rabindra Nath Tagore who wrote many of his works here. Overnight at the hotel in Kalimpong.